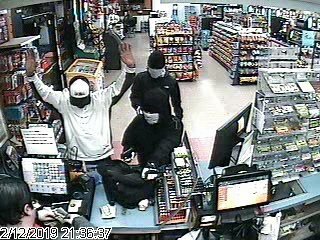 Suspects are pictured in security footage taken at the Texaco on Park Hill Drive in Gainesville. Video courtesy Gainesville Police. Updated: Feb. 19, 2019, 4:59 p.m.
Two men clad in all-black clothing showed a Texaco clerk their guns and demanded money Tuesday, Feb. 12, at the Park Hill Drive gas station in Gainesville. Gainesville Police are investigating the armed robbery case that happened at 1680 Park Hill Drive Tuesday night. The “clerk advised two men came inside dressed in all black with their faces covered, presented firearms and demanded money,” Sgt. Kevin Holbrook wrote in an email. The two men ran away with an undisclosed amount of cash.